Join us at Burley Farms in Epping on September 22nd for SELT TrailFest! This day of fun will feature a 5k trail run/walk, a 1k fun run for kids, a Throwback Brewery Beer Garden, food vendors, and festival activities such as a reptile show, mushroom walk, and games with Seacoast United. 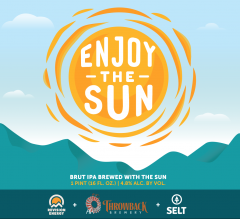 We’ll also release Enjoy The Sun Brut IPA that day, which we brewed exclusively for this event in collaborative vision with ReVision Energy who installed our solar panels. Throwback and ReVision will donate 10% of the proceeds of Enjoy the Sun to Southeast Land Trust (SELT).